SEASONAL FRENCH: If any of Florida’s English-speaking-only prospects is going to learn French simply by the company he keeps, look no further than forward Rocco Grimaldi, who hears plenty of French during summer camp. The 5-foot-6 University of North Dakota player roomed with Jonathan Huberdeau in a previous camp, and the pair playfully kidded one another often, even taking the joking to Twitter. Grimaldi took shots at the Quebec-born Huberdeau’s troubles with English – though in reality it’s quite good – while Grimaldi’s short stature was a source of Huberdeau’s Twitter teasing. In this year’s camp, Grimaldi was paired with Sorel-Tracy, Quebec, native Francis Beauvillier. On the last day of camp following the scrimmage, Beauvillier was casually chatting with the media about how certain English words were borrowed from French – the word petard, from “hoisted by one’s own petard,” for example – when Grimaldi came by. NO TRANSLATION: Speaking of linguistic strides, forward Alexander Delnov was seen doing one-on-one for interviews without an interpreter. When Florida drafted Delnov in the fourth round in Pittsburgh last year, Delnov spoke broken English and needed the assistance of Vadim Podrezov, Florida’s scout in Russia. It’s no surprise that Podrezov came to the rescue. He and Delnov hail from Mytischi, a town just northeast of Moscow. Podrezov helped put the Panthers on to Delnov, vouching for the speed and talent of the 19-year-old who idolized former Panther great Pavel Bure. Florida hopes Delnov (below, left) becomes one of two Russian major finds. Two years ago in Minnesota, the Panthers drafted Delnov’s countryman Yaroslav Kosov (right), who completely bypassed the interview room because of the language barrier. 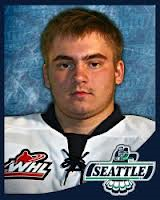 A fifth-round selection, the 6-foot-3, 220-pound right winger has played two seasons for Magnitogorsk Mettalurg in the KHL and scored a hat trick against Germany on the way to earning a bronze medal in this past WJC tournament held in Kosov’s homeland. Scott Luce, Florida’s scouting director, said in St. Paul at the draft that he felt the organization had found a hidden gem in Kosov, who just turned 20. SIZING HIM UP: One Panther who meandered in and out of the dressing room was Huberdeau, whose name slotted low on the list for the exit meetings the team was conducting with each player. Huberdeau said he had received a smaller replica of the Calder Trophy, but what stood out the most about Huberdeau, in his third year in the organization, was the muscle he had added on his 6-foot-1 frame. No one will ever confuse Huberdeau with any winners of the Mr. Universe contest, but he’s also no longer the lanky lad who showed up to camp in 2011 and who’s biggest advice was that he needed to add weight. Look for a slightly bulkier red No. 11 sweater flying toward opposing goalies next season. SCANT FEW: The best deal in hockey is heading toward the finish line as the Panthers announced that its new $7 season ticket offer, which it implemented during Game 1 of the Stanley Cup Final last month — has nearly sold out. Sunrise Sports & Entertainment announced Tuesday that less than 50 tickets remain. Fans who sign up will receive a free jersey, free parking, four free concerts at the BB&T Center, a $25 Duffy’s gift card and more for just $7 per game. Interested fans can call 954-835-PUCK or got to FloridaPanthers.com to order their tickets. LOOSE PUCKS: Florida announced its preseason schedule Tuesday afternoon. The team opens with a doubleheader on Monday, Sept. 16, against Nashville at 2:30 and 7 at the BB&T Center. Florida then travels to Dallas to face the Stars two days later, and again in San Antonio on Sept. 20. The Panthers then play three games against the Lightning — Sept. 21 in Tampa, Sept. 26 in Estero at Germain Arena and two days later at home…Florida inked center Greg Rallo and defenseman Michael Caruso to one-year, two-way contracts. 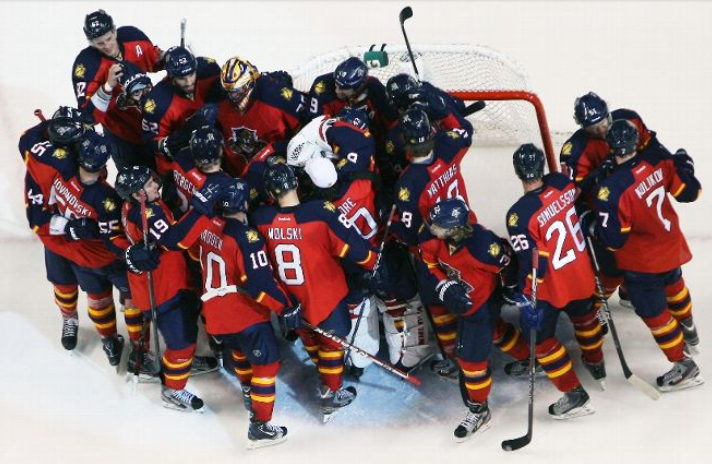 It’s hard to beat covering the Florida Panthers and the NHL, but let’s face it, while covering the Cats last season the low points exceeded the highlights by a margin as wide as a blowout in cricket. Jonathan Huberdeau’s Calder-winning performance over 48 games and winning some shootouts for a change made me perk up, but very little else quickened the heart rate. In fact, the best hockey I enjoyed last season started the day after Christmas and carried over into January – the IIHF World Junior Championship. I was one of the few who set the alarm for 3:45 a.m. here in South Florida, made a pot of coffee and was enjoying the hockey while most in the Sunshine State still had a couple of hours left in dreamland. The 2014 WJC, which will be held in Malmo, Sweden, has a tough act to follow. This year’s WJC was a fantastic experience whose gold-winning moments were outlined in glorious red, white and blue – with a healthy splash of the Panthers’ scarlet as well. It wasn’t only “Go, go, go” for the Pittsburgh native in getting to Russia; Trocheck, a third-round pick by Florida two years ago in Minnesota, went to play and produce. He had an assist and won almost 74 percent of his faceoffs in Team USA’s 5-1 semifinal win over Canada. In the title game, he had an assist and capped off the tournament in grand fashion as Sweden was pressing with its net empty and down by a goal. “Just to be able to go over there at all is an honor, but (to win) is easily, easily my proudest moment as a player. To have the USA crest on my chest is a huge honor,” said Trocheck, who turned 20 during camp. Trocheck said the line featuring him, Rocco Grimaldi and Toronto Maple Leafs prospect Tyler Biggs continued to get better and better during the championship game as Team USA trailed 1-0. Eventually, it paid off with a pair of goals from Grimaldi, who had struggled with bad luck during the tournament, most notably missing by hitting two posts on one shot in the final game. A line featuring a Vinny and a Rocco sounds like something out of a Martin Scorsese film. That couldn’t go wrong, right? “(Rocco) struggled a little bit throughout the tournament and got moved down to the 3rd and 4th line. He was the 13th forward for one game. Stuff like that happens because it’s a short tournament. We knew he was a great player and the coaches did, too, so they gave him a new opportunity in the gold medal game, and he was ready to play,” stated Trocheck. Grimaldi said he just had to keep his head up and try to persevere. His tying goal beat Swedish goalie Niklas Lundstrom on the short side from a bad angle and through a small opening. The winning goal bounced off Grimaldi following a high slap shot by Winnipeg Jets defenseman Jacob Trouba. “It was definitely an up-and-down tournament for me,” said Grimaldi, who has played two years at the University of North Dakota. “It really was a test of my character and how I am as a person. It really grew me as a player and a person. I got determined, and it paid off. It was a huge blessing. 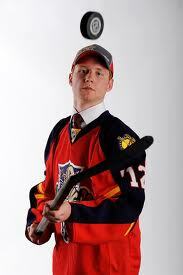 That’s the kind of character and end result Dale Tallon and the Florida Panthers want. CORAL SPRINGS — When you look at various scouting reports on Florida Panthers’ prospect Michael Matheson, the positives seemingly jump off the page. The defenseman can move the puck swiftly out of his end and has great vision to anticipate the outlet pass. Skating? It’s perhaps his greatest attribute. The Boston College sophomore-to-be, the 23rd overall pick last year in the draft in Pittsburgh, was cited by the Florida brass as being the fastest skater in the draft — effortless, fluid and drawing comparisons to Brian Campbell, his brethren in red hair. The downside in the assessment of Matheson’s game is the defensive side, particularly the physical aspect of being a blueliner. He’s not the type of d-man, some say, who will put the body on an attacking forward and win physical battles. “I’d say that’s one of my underestimated areas of my game. I’ve always laid the body and always tried to be a physical guy. I don’t go out of my way to get huge hits,” Matheson said Friday after the scrimmage and shootout demonstration that closed Florida’s developmental camp. In the first of the two 30-minute practice periods in one of those one-on-one moments, the 6-foot-2 Matheson had to separate the puck from forward Rocco Grimaldi, and, well, let’s just say the BC Eagle got the better of the North Dakota Fighting Sioux. Matheson outfought and tossed down the shorter Grimaldi, who has a reputation as a player who, while small, is a strong skater who is difficult to knock off the puck. “Rocco was trying to dangle,” Matheson said, chuckling, while Grimaldi was across the room doing ab work on the dressing room floor. Fluent in both English and French — he hails from Pointe-Claire, Quebec, just west of Montreal — Matheson will return to Boston College and try to get the Eagles to the Frozen Four. There he will be joined in the defensive corps by Ian McCoshen, Florida’s second-round pick in Newark and more of a defensive-minded defenseman. McCoshen, who attended Shattuck-St. Mary’s in his hometown of Faribault, Minn., played three years with the Waterloo Black Hawks of the USHL. “I think I had a good week, though I wasn’t happy with my performance today,” Matheson summarized. “Overall, I was pretty happy with the on-ice sessions and off-ice sessions. It was good to get another view of what level I have to get to to play here. The development of Matheson will be fun to watch on NESN throughout the college hockey season on those nights when the Panthers are idle. You can watch the 19-year-old run the power play for BC coach Jerry York, and no doubt he’ll dazzle you with his skating — he did that in Friday’s scrimmage. And don’t worry about that physical play either.